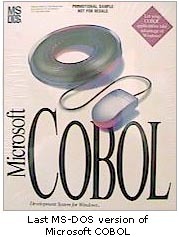 In April 1978, Microsoft Corp. shipped first version of COBOL-80 its third computer language product after BASIC-80 and FORTRAN. Although quite unknown by individual and small business computers users, COBOL (for Common Business Oriented Language) was, and is still used by huge business companies (finance, assurance) in critical areas. 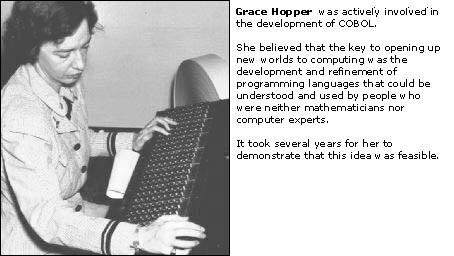 The story of COBOL started in 1959, in a small corner of the Pentagon where Grace Hopper and a team of specialists coming from the computer industry, universities and Department of Defense started to work on initial specifications of a new language intended to be a business problem oriented, machine independent and capable of continuous change and development. The initial specifications for COBOL were presented in April of 1960. Since, COBOL has undergone considerable updates and improvements. It has emerged as the leading data processing language in the business world. Several revisions and standard forms of the language appeared in 1968, 1974, 1985. The latest revision has been completed in 2002. � In 1997 there were about 300 billion lines of computer business code in use in the world. Of that about 80% were in COBOL and 20% were written in all the other computer languages, including C and C++. � In 2000, 95% of finance / �insurance data was processed with COBOL. The Y2K scare was a big reason that a hoard of new COBOL programmers came out of school in the mid to late 90's. COBOL was probably the largest codebase that needed fixing. � Through 2004-2005 15% of all new applications (5 billion lines) will be developed in COBOL. Why such a success? Because COBOL is simple, structured and strong. It can handle very large applications (more than 1,000,000 lines of code). Last version includes object technology, IDE and graphical interfaces as well as integration with the World Wide Web.